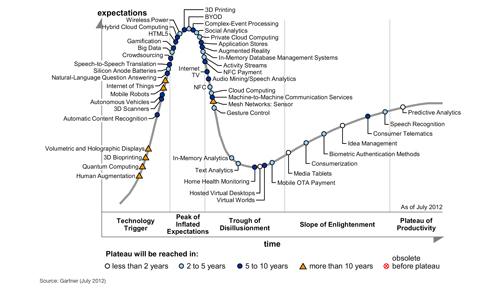 Research firm Gartner has placed NFC payments at the peak of the ‘Inflated Expectations’ curve in its 2011 Emerging Technologies Hype Cycle. According to Gartner, The Hype Cycle graph has been used since 1995 to highlight the common pattern of “over-enthusiasm, disillusionment and eventual realism” that accompanies each new technology and innovation. According to Gartner analyst Sandy Shen, NFC has made the list for the last several years, and the continuous hype surrounding the technology will ensure that it will stay on the list for the next several. Shen added that most of the technologies on the Hype Cycle make it to the plateau, although the time this takes varies depending on the market. In the case of NFC, the wait should fall between 5 to 10 years.